To mark World Elder Abuse Awareness Day, the Honourable Alice Wong, Minister of State for Seniors, held a press conference on June 10, 2013 in Toronto to launch DAWN-RAFH Canada and the Canadian Association for Community Living (CACL) ‘s pan-Canadian community development project “Preventing and Responding to Elder Abuse in the Lives of People with Disabilities and Deaf People”. Older people with disabilities and people who are deaf will benefit from increased access to supports and services aimed at preventing elder abuse through the New Horizons for Seniors Program (NHSP). Minister of State Wong added that the Government of Canada recognizes the great work done by groups across Canada to raise awareness of elder abuse and help seniors protect themselves from its many forms, including financial abuse. As part of these efforts, the Canadian Association for Community Living (CACL) has received $600,000 in funding for its NHSP project. This will help the CACL develop community responses across Canada related to the abuse of older people with disabilities and people who are deaf. The project engages communities to develop tools, resources and best practices on awareness and prevention of elder abuse. As well, older individuals with disabilities and their families will develop individual safety plans to support them in their communities. “Through this funding, the Disabled Women’s Network Canada and the Canadian Association for Community Living, and many other provincial, territorial and local partners, are working together to improve communities across the country,” said Bonnie Brayton, National Executive Director, Disabled Women ‘s Network. For more information on this project, visit the “In Focus:Bringing People with Disabilities Into the Picture” page on our website. 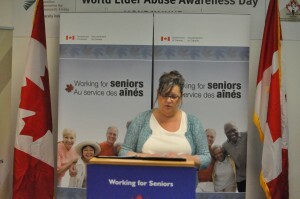 Bonnie Brayton, National Executive Director of DAWN-RAFH Canada, speaking at the press conference on June 10th. 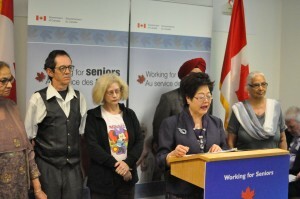 The Honourable Alice Wong, Minister of State for Seniors speaking at the press conference on June 10th.